The road to Penticton and #WBC13 was paved with great times and fine wines. Take a look below at the entire journey from Portland to Penticton -- 7 days, 11 hours, and 42 minutes condensed into one crazy food, fun, and wine infused video! Our last segment of the trip took us along scenic Highway 3 to Oliver. Along the way we had an epic picnic and even scared away a few startled travelers as we were a sight to behold. More wild than the wildlife. All that fresh air can make you very hungry. We ate our lunch with a magnificent mountain backdrop and then drove on to Oliver, where we stayed the night. 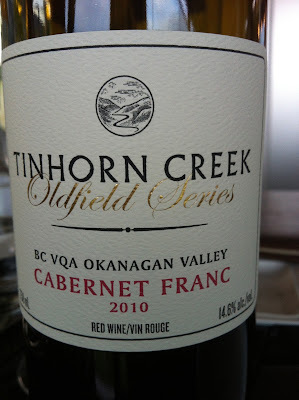 The first time I visited the Okanagan region I was very impressed with the Cab Franc I tried there. 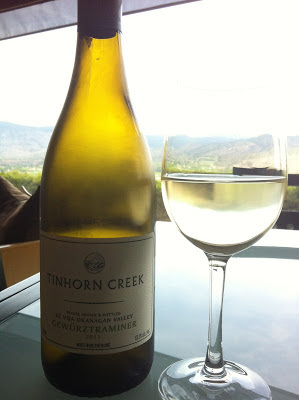 One of my favorites was from Tinhorn Creek Winery and I was excited to share my findings with Mattie and Miss Kristen. Well, the truth is, I have not been able to shut up about the Tinhorn Creek Cab Franc for over a year now, so it was time for me to step aside and let the wine do the talking. 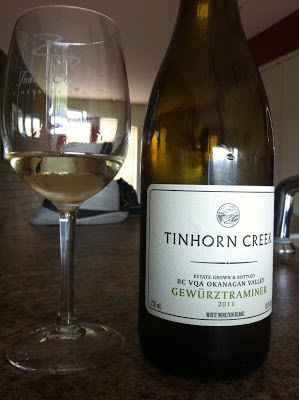 We began our visit with a glass of the Gewurztraminer that was chilled and waiting for us in the guest house. Ahh... the pause that refreshes. We would have been happy to sit right there contemplating the view for the rest of the evening, but dinner at Miradoro was waiting just a few steps away, along with Mattie and Kristen's first taste of the fabled Oldfield Cab Franc. The views at Tinhorn Creek (see them in video at top of post) are best enjoyed from Miradoro where we dined with the Tinhorn Creek gang: Andrew, Lindsay, and Sandra. The evening was a winning combination of interesting personalities, fine wine and big views. Or maybe it was fine personalities, interesting views, and big wines--it all works out any way you stack it. It’s great when you can hang out with people and find things to talk about that have nothing to do with their profession or business. We all seemed to have a common bond and affection for film, travel, and great food. Well, no surprise about shared interest in food, but Sandra, Lindsey, and Andrew are all interesting in ways well beyond the world of wine. The next day prior to the start of WBC13 in Penticton we stopped in at Upper Bench Winery and Creamy to meet with Gavin and Shana Miller and sample their cheese and wine. The Upper Bench wines have true finesse and naturally the house made cheese make for delicious pairings. Shana is the engine behind the on-site micro creamery and Gavin is the man of the vines. What a powerhouse team they make, and the products of their labor are exceptional examples of what one can create when passion meets know-how. I thought the King Cole, a semi soft blue cheese was the ideal with Merlot. I’d tried the Gold, a handmade semi-soft cheese, on a previous visit to the Okanagan Valley and it was as good as I remembered it. The U & Brie was also a delight, rich and creamy with a fresh tang, that was firm and not over ripe. I liked it with the Rose as well as the Riesling. Give yourself plenty of time to stop at Upper Bench when you are in Penticton. It’s just the kind of place where you could settle in for a while, a long while. It was a memorable road trip, but sadly, my crazy glasses were lost somewhere after our visit to Upper Bench. So off to the universe they go. It’s especially sad as I had the round ones for 18 years!! Those glasses have been all over the world with me. They were even featured on the cover of my book. But sometimes you just have to let go and move on. 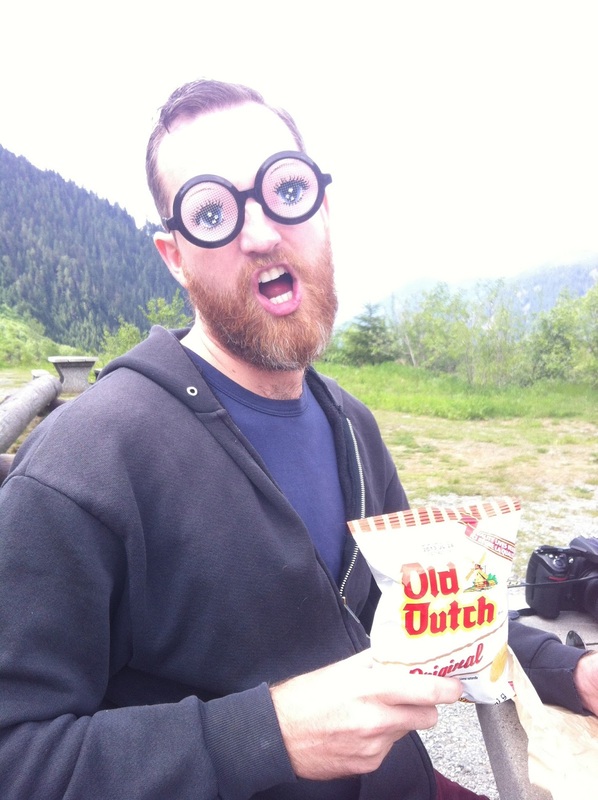 I’m looking for something new to use in future trips, but if you happen to see anyone in Penticton wearing some crazy glasses, you know where they came from! Note: Overnight accommodations in Oliver were graciously provided by Tinhorn Creek.